Launched by: Bihar state government. Loan amount: Up to Rs 5 lakh to each beneficiary. To benefit economically weaker sections. 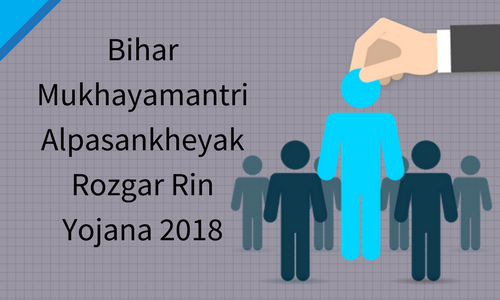 Bihar state government has launched Mukhayamantri Alpasankheyak Rozgar Rin Yojana for minorities. This scheme will generate employment openings for the Alpasankheyak (Minorities) who belongs to families which have a modest income. The state government will allot Rs. 100 crore per year for employment generation from the fiscal year 2017-18. The state government has changed the guidelines of Chief Minister Minorities Employment Loan Scheme. The new guidelines will boost the employment opportunities for minority candidates like Muslim, Sikh, Parsi, Buddhist & Christians. Under this scheme, unemployed candidates can get loan amount up to Rs. 5 lakh for businesses. Bihar State Government will use this fund as Revolving funds. Bihar Government will give loans up to Rs. 5 lakh to the chosen candidates on the following interest rates. The interest rate applicable loan amount is 5% which is calculated quarterly. The moratorium period on loan amount is 3 months which is completely interest-free. If applicants pay the loan amount within a specified time, the state government will grant relaxation of 0.5% in interest rate. The applicants have to reimburse their loans in 20 equal quarterly instalments. This scheme will give benefits to the unemployed minorities by Direct Benefits Transfer (DBT) in their bank. The age group of the applicants must be in between 18 years to 50 years. Applicant must belong to the district where he wants to start his business by using the loan amount in Bihar. The applicants must not be working with any government or semi-government organisation. The applicant must belong to the minority category and the annual income of the family from all sources must not exceed Rs. 4 lakh.